The first time Kung Fu Panda came onto my radar, I was skiing in France. Or, more accurately, I was standing unsteadily on a pair of skis, utterly hungover from a skipload of Jaegerbombs the night before, sweating like a hammer from the sheer effort of keeping upright. It was in this state that I woozily focused on a billboard advertising a new film called Kung Fu Panda. Consulting my French phrasebook, I deduced that this was a film about a panda that did Kung Fu. It was all too much for my addled brain and I collapsed and demanded I be returned to my bed immediately. Or at least a nearby bar. Sometime later, safely home and nursing my fragile body back to health, Kung Fu Panda passed me by in the cinemas, despite good reviews. Having not seen the first one, there seemed little point in catching up with the sequel, so it wasn't until a Kung Fu Panda double DVD pack entered the house that I caught up with them. And you know what? They're pretty darn good. 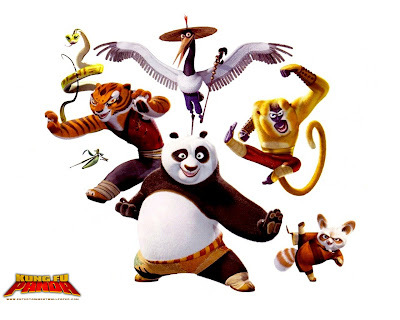 The first film introduces the portly, clumsy panda Po, who is unexpectedly chosen by an ancient prophecy to be the next Dragon Warrior, much to the consternation of his master Shifu and his fellow warriors, the Furious Five. The all-star voice-cast (Jack Black, Dustin Hoffman, Angelina Jolie) deliver some good laughs as Po overcomes his obvious weaknesses, gets to grips with his destiny and proves his worth. It's all fairly predictable, but in a good way. However, enough about the comedy, it's the action sequences that really catches the eye, particularly those surrounding the villain Tai Lung, a vengeful snow leopard hell-bent on destroying his former master Shifu. With the animation allowing movement that would be just silly in real-life, it delivers some thrilling chase and fight scenes, with Tai Lung's escape from prison and the ensuing confrontation with the Furious Five on a rope-bridge brilliantly realised. Kung Fu fighting in the movies always looks a bit cartoonish, but this is fantastic entertainment. The sequel is more of the same, although it's not as funny, preferring instead to up the emotional ante as Po finds out his father, a goose, is not actually his father. On a quest to find out Who He Is, he falls foul of an evil peacock, who doesn't quite measure up to Tai Lung in the villain stakes, despite being blessed with the sneering, menacing tones of Gary Oldman. Once again, though, it's those action sequences that provide the high points with some thrilling moments of action. Having said that, the most effective part comes near the end. Who'd have thought an embrace between a fat panda and a neurotic goose would be so touching? Everybody was kung-fu crying. The ultimate compliment? Even Jack Black's comic schtick is panda bear-able. I'm wondering to take it again, because it would feel so good with a real pad. Well, that's good to know. I have to go now, because I'm due back on Planet Earth.